Front-end development used to be (kind of) easy. You could install a bunch of browsers on a couple of different computers / operating systems, physical or virtual, and use the developer tools built in almost every browser to solve compatibility problems, or work around different implementations of web standards. This is no longer the case, not since cellular networks became faster, phones became smarter and light “tablet” devices offered yet another way to connect people to the internet from wherever they are. 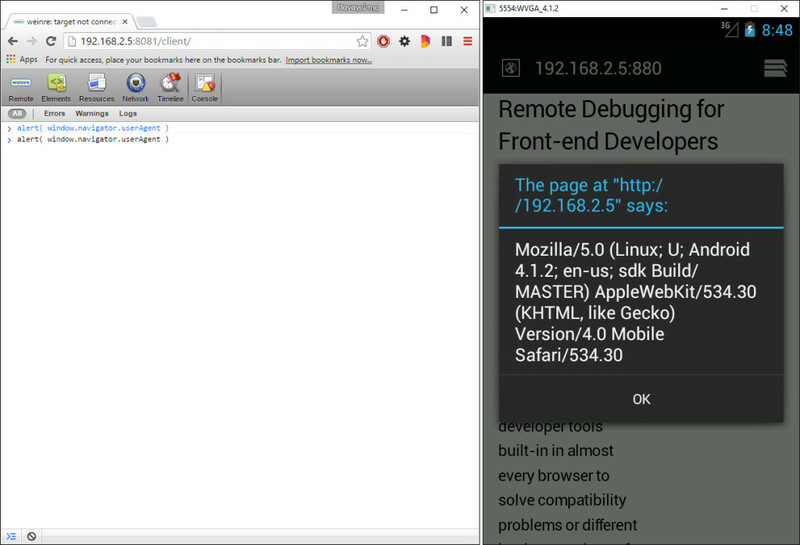 Debugging in these (mostly) mobile devices is a different kind of game, and the fact that more than a dozen different mobile browsers exist is not making the job any easier. 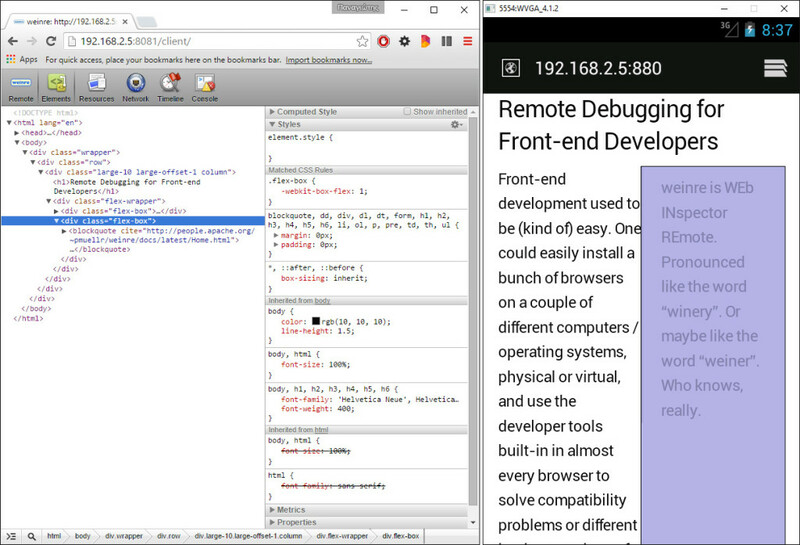 This is where remote debugging comes in handy. 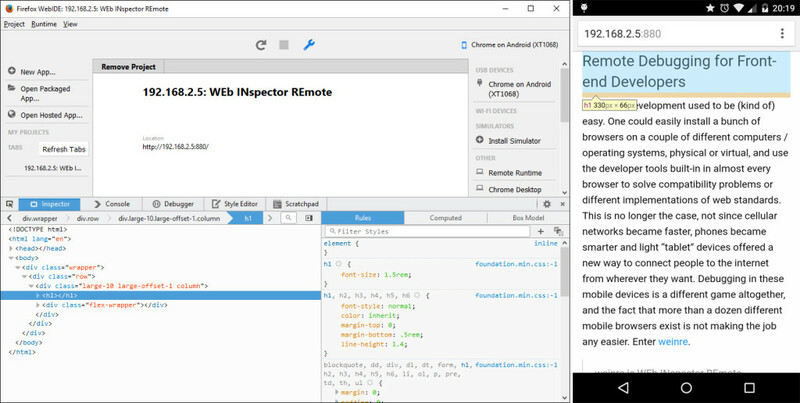 WEb INspector REmote was built to enable remote inspection and debugging of web pages across different devices. It’s a useful tool, especialy when you need to debug a ”UIWebView” or Safari on iOS while developing on Linux or Windows. 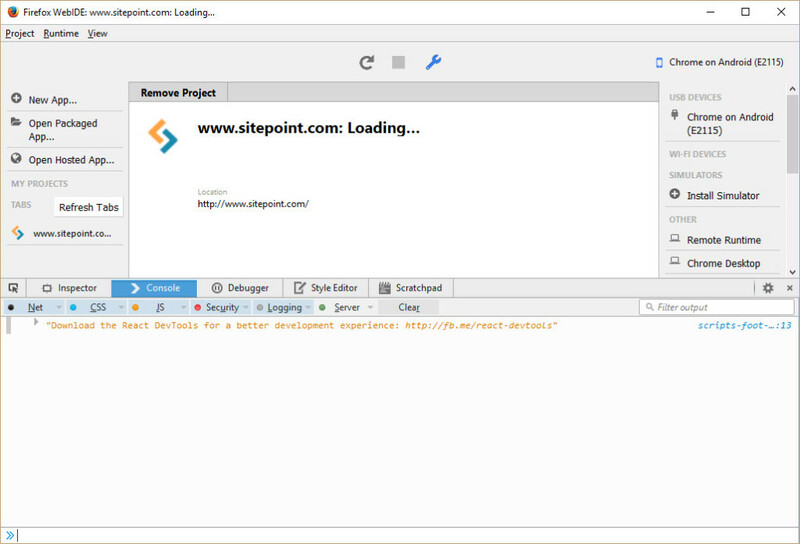 weinre reuses the user interface code from the Web Inspector project at WebKit so most front-end developers should already be familiar with the toolbox. The documentation is not quite as clear on how to use weinre on Windows, so I will provide a bit more information on the Windows side of the process. The first thing you should know is your IP address, because visiting the pages on localhost or 127.0.0.1 won’t do. You can find out your IP using ifconfig on Linux or Mac OS and ipconfig on Windows. A static IP address would be ideal for developers using weinre, otherwise you may have to discover your IP every time you boot your computer! How to obtain a specific IP address from your local network is beyond the scope of this article, but here is a guide for Windows, a guide for Mac OSX and one for Ubuntu. <p>Front-end development used to be (kind of) easy. around different implementations of web standards. If you don’t want to configure weinre every time you run it, you should make a server.properties file in a .weinre directory. Open a command prompt in your profile directory (Windows users: you must use the console to make a folder with that name! Press Win + R and type “cmd” or press the “Windows” key, type a few characters from “command prompt”, then press enter) and type mkdir .weinre to make a new directory. The resulting path for Windows users, should be something like C:\Users\YOU_USER_NAME\.weinre. 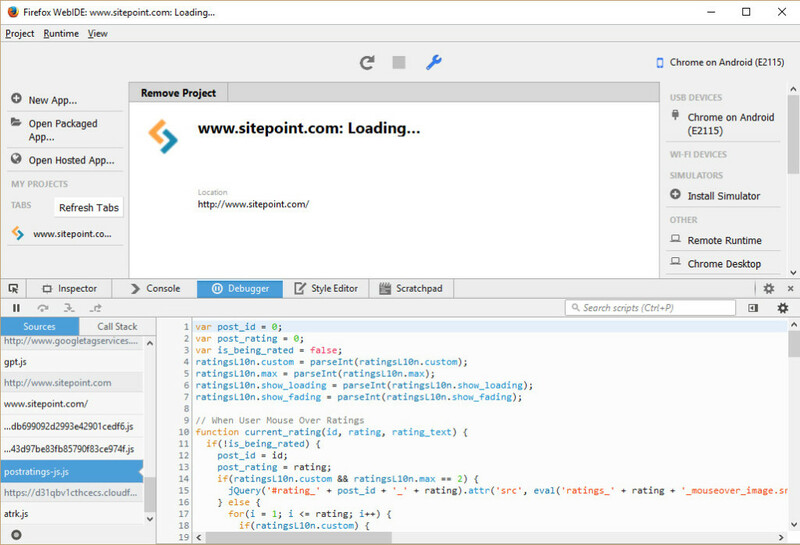 Prepros is a tool to compile Less, Sass, Compass, Stylus, Jade and more with automatic CSS prefixing, a built-in server for cross browser testing and remote debugging capabilities. It even works cross platform! 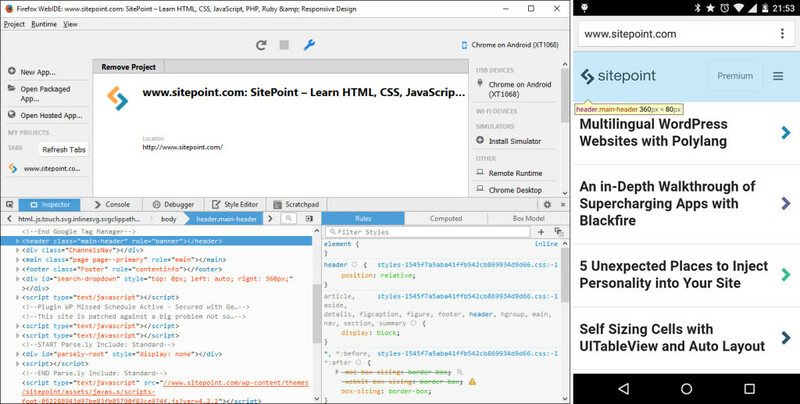 Valence is an add-on for Firefox that enables the Firefox Developer Tools to remotely inspect / debug Gecko-based browsers, Chrome, and Safari on iOS. 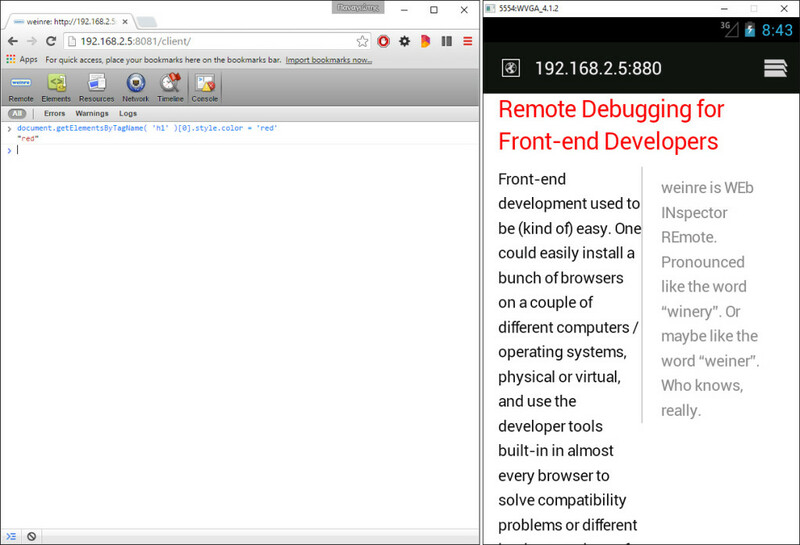 The debug “target” can be an iOS device or a Chrome desktop browser (using the --remote-debugging-port=9222 special “flag” to allow remote inspection — see the Chrome Desktop setup paragraph on the Valence site for instructions) or Firefox OS. Valence, unfortunately, cannot inspect Android device emulators, or older Android devices, but UIWebViews and Simulators on iOS can be inspected — although I haven’t tried it, since I don’t own an Apple computer. The smartphone / tablet must be physically connected to your computer and if you are using Windows, you will probably need to install USB drivers for your device, which may or may not even exist! Windows users will also have to install iTunes if they need to inspect iOS. Lastly, developer mode and/or USB debugging must be enabled — please remember to deactivate the settings when your work is done! Valence is rather limited at the moment, and somewhat unstable as an early beta can be, but it is a promising tool. Ok React… thank you for leaving the console message for me below!